Rogue Farms holds a special place in our collective beer-filled hearts. We’ve made multiple trips out to the Independence, Oregon, farmstead to learn about the science and culture of growing hops at Rogue’s 52-acre yard; the farm also cultivates everything from marionberries and pumpkins to hazelnuts and honey, all of which is used in the craft brewing and distilling of Rogue Ales and Spirits. Rogue Beer Farmer Cher Gillson has become a special envoy for the CBB Nation (which is not unlike the Rogue Nation), providing this trade website with not only vast amounts of beer farming knowledge every time we see her (or e-mail her), but also food, shelter and copious amounts of craft delicacies every time we visit. 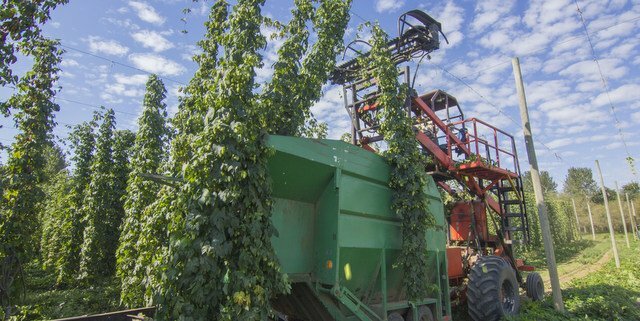 Watch Gillson both above and below teach us about the hop farming process.